Many people think I am crazy when I tell them I've visited Walt Disney World solo before. I'm often asked, "Isn't it scary? Don't you get lonely?" Truth be told, no and no. My first solo visit was in 2005 and my most recent solo visit was just a few months ago. Both solo trips and visits to Walt Disney World with family and friends have brought me great memories and fun times. Here I'd like to share a few tips and some advice for those who may be thinking of or planning a solo visit! 1. - Don't be afraid to try new things! There may be an attraction you've always wanted to see or a resort where you've always wanted to stay. Maybe you've always wanted to book your next trip staying at Wilderness Lodge or Coronado Springs, but your travel party didn't want to. Have you always wanted to try sushi at Tokyo Dining, but your kids would rather eat at Chef Mickey's? This is the time to do all of the things you've always wanted to do, but maybe never got the opportunity to. 2. - Utilitize Single Rider Lines! 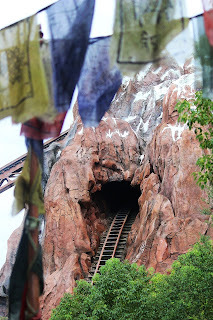 A few of the most popular Walt Disney World attractions have Single Rider Lines. Waiting in this queue will place single riders into any open seats on attractions such as Rock N' Roller Coaster and Expedition Everest that may not be filled by guests waiting in the Stand-By and FastPass queues. It's a great option for a party of one! 3. - Snacking and quick service can make meal time less awkward. For me, my only issue traveling solo is dining. While some people have no problem sitting down to a table service meal and having dinner alone, it just isn't for me. Many people I talk to who are traveling solo or are thinking of traveling solo have this concern as well. I've found for myself, quick service and snacking is what works for me. With a quick service meal, you have the option of choosing somewhere to sit. Often, if there is outdoor seating available (such as at Liberty Inn, Cosmic Ray's and many other quick service dining locations), I will find a seat outside, enjoy my meal and the atmosphere. Other times, I've found having a snack and finding a bench or even strolling along while eating works well, too. And in this case I've determined that Dole Whips and Mickey Bars should be classified in their own food group! 4. - Cast Members are your friends! Countless times on my trips (both solo and with others) I've made small chat with Cast Members while waiting for shows to start or just browsing in a store. This happens to have a huge impact on my solo trips. As a party of one in Walt Disney World, one can sometimes feel intimidated. It's a huge place with many, many people. Being far from home (even at your second home) and not having anyone I know nearby kind of scared me at first. Who would I talk to? What if I needed something? That's what the Cast Members are for. Maybe you have questions, need assistance or maybe just a small chat to make you feel less alone! 6. - Take lots of pictures! 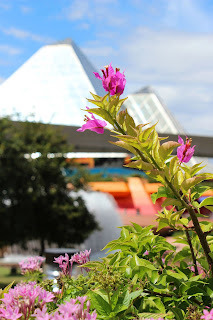 One of my favorite things to do on a Disney vacation is take pictures. I could spend hours upon hours taking photos of Cinderella Castle, World Showcase and the animals at Disney's Animal Kingdom. Traveling with others can make getting those picture perfect shots a little difficult. I don't want to keep people waiting, so I snap my picture and move on. Traveling alone, I'm able to take my time and take all of the pictures I want. And don't forget to include yourself in the photos! Ask a Cast Member to take a picture of you in front of your favorite park icon or with your favorite character. Disney's PhotoPass is a great option for solo travelers who want to get lots of pictures with themselves in it! I want to end this post with my biggest piece of advice for those considering a solo trip to Walt Disney World. Do it. You can go at your own pace, do the things you've always wanted to do (and as many times as you want) and experience Walt Disney World the way you want to! Have you traveled to Walt Disney World solo? What was your favorite part?